Calling all NetGalley members! Are you out there? I need you! Why? 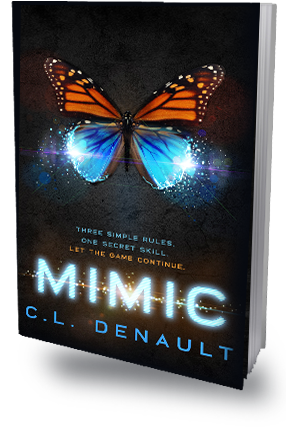 Because Mimic has been released into the world, and it's time to embark on the quest that most indie authors find challenging: getting reviews. Hey there! As promised, I'm running a giveaway in conjunction with the Mimic Book Blitz that begins on the March 22nd release date. The blitz will help spread the word, but I'm starting the giveaway early to reach more people (a.k.a. potential winners). The Core is a reeling combination of fame and disaster, and no one knows better than Toby how hard it is to hide one's true identity. His challenges aren't lost on Willow. She's struggling with a strange new facet of her own identity, and while she doesn't trust Toby's mysterious agenda, part of her admires his resilience. He's playing the Core's game with a stealth she has yet to learn, and for some reason, he's chosen not to reveal her secret. And she won't reveal any of his. It's an extremely dangerous move, but she's making it. Like Fenn said, this city is a chessboard. And the little Butterfly is playing to win.